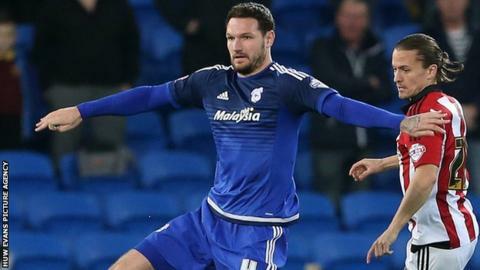 Defender Sean Morrison says manager Russell Slade deserves credit for the revival of Cardiff City's season. Cardiff are four points off the Championship play-offs, having lost only twice since a transfer embargo was imposed in January. Morrison, 25, says the Bluebirds have made big improvements during the campaign. "The boys would do anything for each other and fight for every point," Morrison said. "That's all credit to the gaffer - he deserves a lot of credit for the job he's done. "When he came in the club was in a difficult position. He's put a great changing room of players together and that's down to him and the coaching staff. "They make it an easy place to come and an enjoyable place to work. I think that shows on the pitch compared to maybe the beginning of last year." Slade's time at Cardiff since joining from Leyton Orient as Ole Gunnar Solskjaer successor in October 2014 has been eventful. The 55-year-old's contract expires at the end of the current season. Morrison featured in Cardiff's 0-0 draw at Burnley and played his part in a solid defensive display which frustrated the Championship leaders. Despite securing a point at Turf Moor wins for Sheffield Wednesday and Derby County saw Cardiff lose ground in the race for the play-offs. The Bluebirds are now four points behind the play-off places in seventh but Morrison remains hopeful. "There's still six games to go and they've got some hard games coming up and they're not going to win all of them," Morrison added. "We need to keep plugging away, doing what we're doing and pick up as many points as possible. "We're still on track and we'll just keep going." Saturday see Cardiff travel to Fulham, who eased their relegation fears by moving seven points clear of the relegation zone with a 2-1 win at Preston on Tuesday.